Your office’s location can have a huge impact on your bottom line and this can either make or break your business. This is why experts are looking for office rentals in Sandton, as this is key to the success of their operations. Location, location, location is the mantra of successful businesses. What your office looks like is not as important as where it is located. A small-scale office in Sandton might be better for your bottom line than a large warehouse in Lanseria. The latest trend in office space rentals is shared workspaces or flexible workplace designs, and The Business Centre is at the forefront of this trend. We will be taking a closer look at renting office space in the Sandton business district. Surroundings/Location – What does the outside of the office space look like? Would your clients like coming to meet you at the office space and will they be able to access it easily? Interior style – Do you like the décor and style? You and your clients are going to spend a considerable amount of time there, you should at least like the wallpaper. Utilities – What does the office space offer? Consider the office size, technology, Wi-Fi, access to kitchen facilities, and meeting rooms. Ensure that you would have everything you need to run a successful business. Flexibility – How flexible is the contract and are you getting a good deal? Can you set up a virtual office and upgrade if needed? And always be aware of hidden costs! Support/Operational extras – Is there a receptionist or IT support team you can use? What about a coffee machine? Find out what is included and excluded. Sandton is home to many large and influential businesses. Rivonia is also a popular location for start-ups who want to be close to the “buzz” of Sandton. Sandton is regarded as one the richest and most influential areas in Johannesburg, if not the country. When you rent office space in Sandton, your business will automatically be seen as more professional and established with a Sandton office address on your letterhead. The area has easy access to all of the major roads and with the Gautrain and public transport easily accessible, getting around is a cinch. 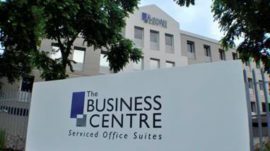 The Business Centre Rivonia has 80 modern offices; high-speed internet; boardrooms and meeting rooms; a business café; daily office cleaning; 24-hour access-controlled security; and a professional receptionist. Located in the heart of Rivonia in Sandton, businesses can enjoy easy access to malls, restaurants, and pubs. The Business Centre Rivonia ensures that you get to do what you do best – concentrate on your business. Sandton is the perfect place for your business and provides endless opportunities. Who knows what could happen? Anything is possible in a Sandton office space.